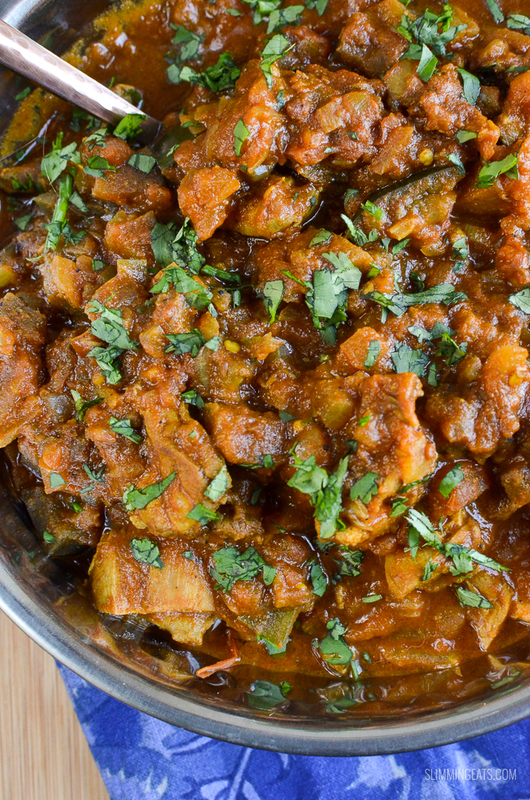 A delicious low syn Chicken and Eggplant Curry – packed with flavour and full of speed foods. Do you struggle with adding speed foods to your plate? 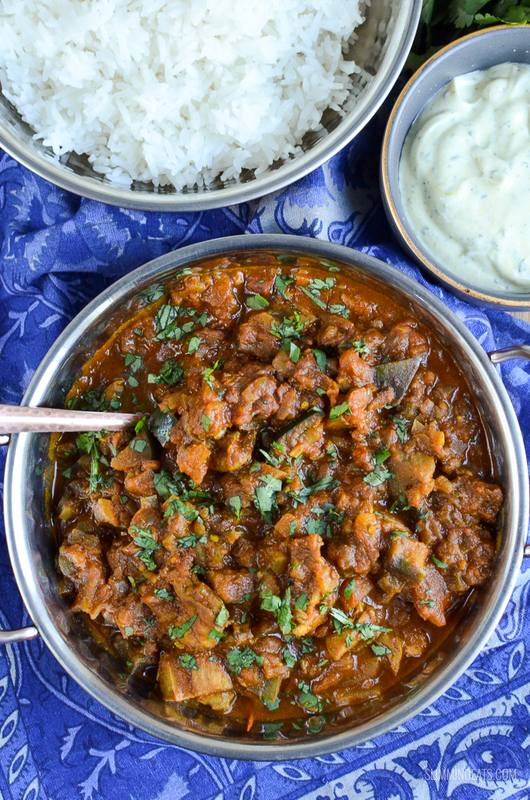 If so you need to make this curry. It comes packed with plenty of speed and tastes amazing. Seriously it’s one of my favourite curries. 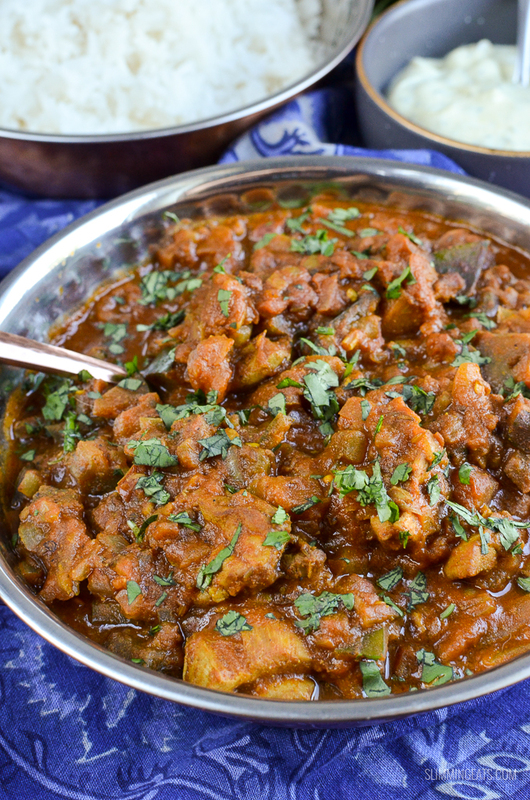 Eggplant (or Aubergine) has a magical way of bulking out a dish, it needs to be cooked correctly and for long enough otherwise it can taste a bit tough, but get it right and it is lovely. 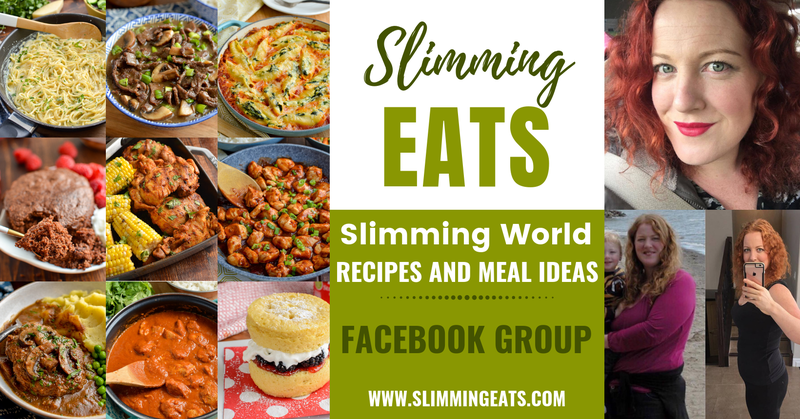 It’s actually one of my favourite vegetables and I have a few recipes on here such as this Aubergine Lasagne, Moussaka or these amazing Moussaka Meatballs. 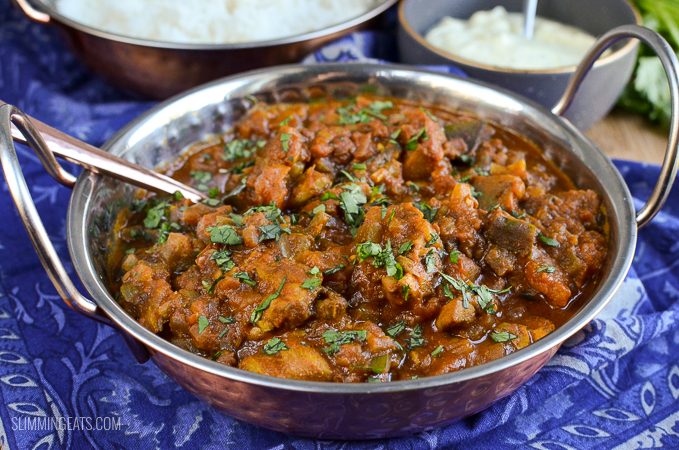 This Chicken and Eggplant Curry of course is not suitable for vegetarians, so if you would like to try a meat free version of a curry with eggplant (aubergine) – try this Eggplant, Sweet Potato and Lentil Curry which is also delicious. 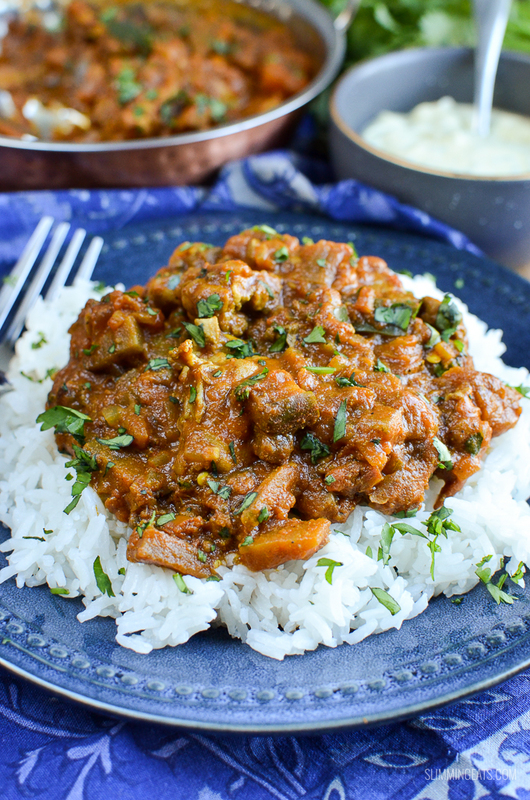 That curry has the addition of some coconut milk which makes it super creamy. If you are on a SP day this is perfect served with either this Roasted Cauliflower Rice or this Cauliflower and Zucchini Rice. Not on a SP day? – then it is perfect with some basmati rice and a mint yoghurt. I make my mint yoghurt by mixing some fat free plain yoghurt with a little lemon juice, some sukrin: 1 (natural sweetener), fresh mint, and a pinch of turmeric for colour. 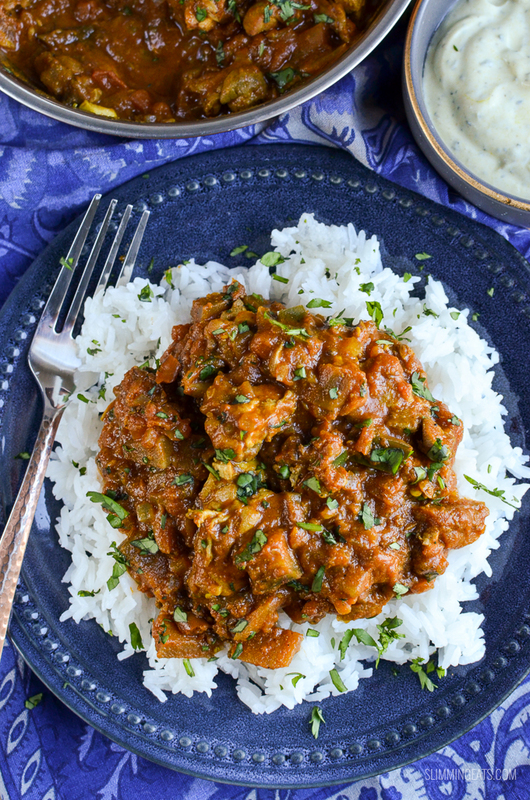 This delicious Chicken and Eggplant Curry can also be cooked in a Instant Pot (a multi function Pressure Cooker and one of my most used kitchen items). This is one of the best things I have ever bought and I use it almost daily in one way or another. It is basically a 7in1 cooker, and it slow cooks, pressure cooks, saute’s, has settings for soup, chilli, rice, porridge and even makes yoghurt (I haven’t tried that yet). Hey I even cook my boiled eggs in this, you should see how effortlessly they peel. If you really don’t want to use any syns you can make this syn free by using a spray oil. 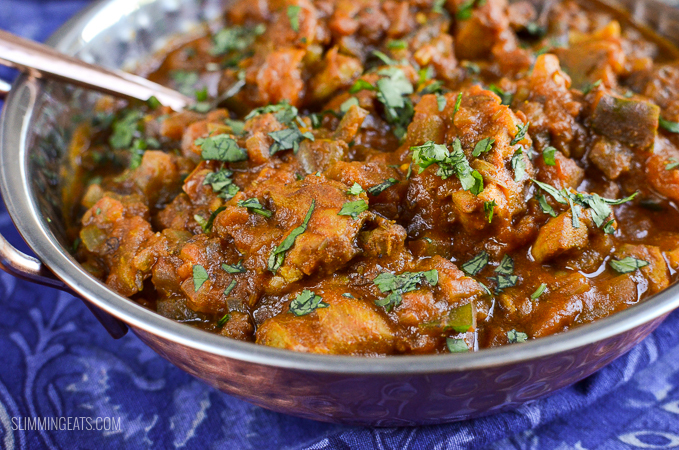 But honestly, curries need a little bit of oil to cook the spices, it really improves the flavour and a little bit of oil use isn’t too high synned once divided into portions. 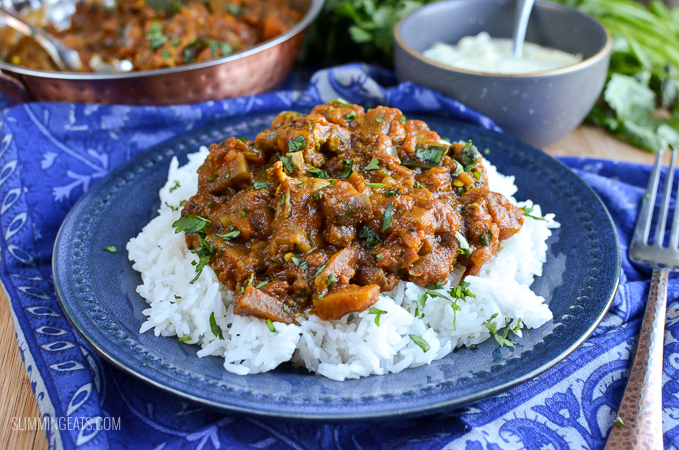 Try this Chicken and Eggplant Curry for dinner tonight!! Add the ghee to a large frying over a medium heat. Once melted add the mustard seeds. Once they start to pop, add the onions and fry till softened. Add the garlic and ginger and chicken thighs and fry until lightly browned. Add the chilli, cumin, coriander, garam masala, turmeric and tomato paste and stir to evenly coat. Add the eggplant, chopped tomatoes and stock. Once hot add ghee and mustard seeds. Add lid, close valve and set to manual high pressure for 10 mins. Once finished cook, turn off and Allow a natural pressure release for 10 minutes. Sprinkle with fresh chopped coriander and serve with your choice of sides. Ingredients can vary greatly from brand to brand and therefore it would be impossible to give accurate information. Also double check syn values of sinned ingredients as different brands can vary. Ginger is mentioned in the instructions but not in the ingredients. I added a small piece of ginger and this worked well. Nice recipe. Thanks. I must of missed it when typing up. I have corrected it now. 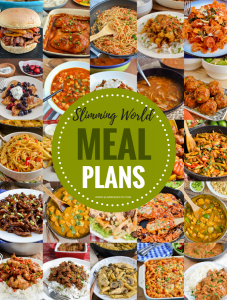 Hi – I love your recipes – I was just wondering if I could use a regular pressure cooker for this and other insta pot recipes you have – as I got a Tower 6 litre pressure cooker for Christmas. Hi Gina, yes you certainly can. Hiya. Making this tonight – can I use Frylight instead of oil? Made this for the first time tonight. I really enjoyed it but OH said it was OK. I guess he doesn’t like aubergine(eggplant) much.